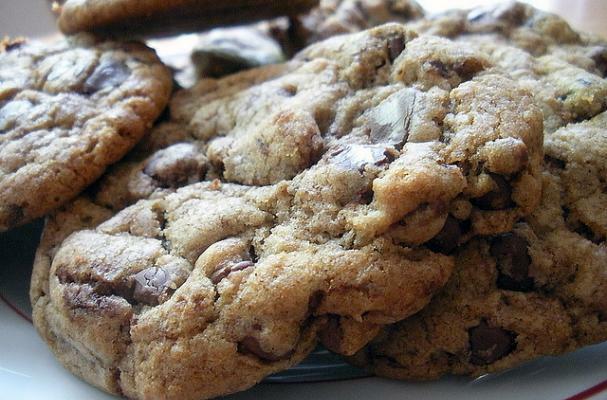 Remember the story about the Neiman Marcus cookie recipe costing $250? A similar tale floated around about the Mrs. Field's cookie recipe. As it turns out, it's simply an urban legend. In fact, this "expensive recipe" story has been going on for more than half a century; the name of the company involved is the only thing that changes (read more about that here). I got my hands on (at no cost) the Neiman Marcus cookie recipe about 25 years ago. I found it scribbled on a sheet of high school-esque binder paper, carefully folded up, and stuffed (among a number of other edible treasures!) in an old recipe box. What makes these cookies so decadent (other than the fact that they come from a high-end department store) is that they include both chocolate chips and 8-ounces of shredded chocolate (we use dark for both). The deliciousness doesn't stop there. It also includes oatmeal, but you blend it into a powder! The result is a super chocolatey oatmeal-flavored cookie, but minus the typical chunkiness of whole oats. Perhaps Neiman Marcus was going for a haute cuisine cookie? In a large bowl, cream together the butter and both sugars, then add the eggs and vanilla. Add the flour, oatmeal, salt, baking powder and baking soda. Blend in the chocolate chips, grated chocolate bar, and nuts. Mix until batter is well incorporated. Note: the image featured above is not the actual cookie.